Their health decline is connected to a change in their diets, which coincides with farmland being converted to livestock and families leaving the rural area. In a small health survey, we found that a family of four consumes, on average, a gallon of oil every two weeks, deep frying their eggs, salami, and cheese in the morning and evening, consuming 4-6 deep-fried eggs, per person, per day, while consuming two to three servings of deep fried salami, cheese and processed foods. Today, corn oil, eggs and salami are cheap and accessible; fresh vegetables in rural areas are expensive and inaccessible. In fact, no one in La Cumbre now has a vegetable garden. 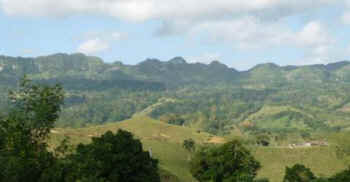 Small family farms are scarce, trees have been cut down, the stream at the base of the mountain is filled with topsoil and cattle are seen grazing across the land. Twenty-five years ago, this small Dominican village had 100 homes. Today, La Cumbre has no more than 20 homes. Like other areas across the world, rural to urban migration has been substantial and like the U.S., small family farms have disappeared. Those buying the land are often individuals who don’t live in the area, but abroad or in large urban areas. Once purchased, the land is cleared of trees – mango, orange, avocado, cacao (chocolate coco trees), banana, coffee and plantains – and cattle are brought in. After two or three heavy rains, the topsoil erodes, filling in the riverbed. I have lived in La Cumbre and have worked in villages throughout this region – for over twenty-five years. At first, I lived in a small rural health clinic, where I worked with village health workers. I oversaw a seed bank, providing families throughout the region with vegetable seeds – beets, tomatoes, lettuce, spinach, carrots, okra, cucumbers, peppers, radishes, eggplant, etc. I was introduced to almost everyone in the region through this project. Several families walked over an hour to get to the clinic. I found myself going to the capital on a regular basis, just to replenish the seed bank. As we know a whole food, plant-based diet is the optimal diet, so it’s safe to say these vegetable gardens, which they grew year round, had an impact on their health. In fact, the main health problems addressed in the clinic were related to improper sanitation (i.e., unfiltered drinking water, lack of latrines, etc.). Those who came to the clinic with health problems were often children, mainly with parasitic and infectious diseases – and if adults came, it was with gripe (head or chest colds) or with illnesses such as hepatitis A or B. Today, this is very different. When asked about their health, they respond almost unanimously, “We are unhealthier. We have diabetes, high blood pressure, high cholesterol, cancer and heart disease – and a lot of it.” And I would agree. Most of my friends, who are in their mid thirties and forties have high blood pressure, diabetes and/or are substantially overweight. I could spend hours addressing why this is occurring, not only in La Cumbre, but also in thousands of other villages, towns and cities across the world. However, this is not my goal here. For those who want to understand this further, I suggest you read David Simon’s, Meatonomics, addressing the economics behind these trends as well as Richard Oppenlander’s, Comfortably Unaware, discussing the sustainability of this type of system – for our planet, our resources and ourselves. Both texts highlight the need for action. Using La Cumbre as a case study, I want to share how Global Roots, together with La Cumbre plan to address this. Global Roots is an organization located in Durham, NC and has a satellite office in La Cumbre, which sits on a mountaintop beside the area that was once covered with small farms and fruit trees. The plan of action utilized by Global Roots is simple –partnerships, education, and community action—with the goal of creating a vibrant (healthy), inclusive and sustainable community. The first step is to create partnerships with organizations in La Cumbre, specifically, Ama de Casa (a local women’s group), the agricultural association and Junta de Vecino (Neighbors Together). We use these partnerships to explore the current situation by first discussing the economic livelihood of those living in the village, how and why people are not working, household (food, health, schooling) expenses, and who has what skills, training and education. This is followed by an exploration of the principal health problems, what’s believed to be the causes of these illnesses and what can be done to address these issues, using community resources. La Cumbre has proposed to create a cooperativo, for families in and near the village to work and/or invest in a large track of land, producing fresh produce to be consumed and/or sold. Four acres of the nearby mountainside land will be used in this project. Cattle from this land will be removed and the first two acres will be reforested with fruit trees. The other two acres, originally producing 480 pounds of livestock (which by U.S. standards feeds only 2.5 people/per year) will be replaced with 30,000 pounds of plant products, feeding all those in the village, families outside the village and generating income for those in the collectivo. In determining what plants to grow, Global Roots proposes to work with families to create a nutrient composition chart and a recipe book for each plant, highlighting multiple ways to prepare each plant as well as how one lives a healthier life on a whole food, plant-based diet. Through this process, families come to recognize that all plants contain a healthy balance of protein, fiber and vitamins but with no cholesterol. To share lessons learned, struggles and successes, those involved in the project will keep a blog (www.globalroots.net) – documenting the environmental and health implications of this initiative. Perhaps this one example will motivate others, regardless of where one resides, to reclaim their land – to build a sustainable community – to replenish our planet and to reclaim our health! Oppendander, Richard (2012). Comfortably Unaware; What we Choose to Eat is Killing us and Our Planet. Beaufort Books, New York, NY. LeAnne Campbell, PhD is the Executive Director and Founder of Global Roots. She has over 30 years of experience designing education initiatives, specifically leadership programs, professional training for teachers, cultural immersion programs and curriculum development workshops. She is the author of the best-selling China Study Cookbook and editor of The China Study All-Star Collection and The China Study Quick and Easy Cookbook.